Hey friends, campus recruitment have started and as you read in the previous blogs about Interview attires for both men and women. Getting a job isn’t that easy. There is a chain of process after which only some people get selected. Last year I observed a couple of off campus for engineers and I saw that out of thousands of people coming for the job, less than ten people got jobs in any company. Some companies even took only one or two out of a crowd of hundred. This year I observed a marketing company’s off campus which as always came by surprise within a short notice of one day. The selection process included written and group discussion rounds. These two rounds are found in almost every exams held in India, be it an off campus recruitment process of a company or selection process for top IIMs. Written includes aptitude and group discussion gives an on spot subject to talk on with at most 10 people. ?Getting through with written and group discussion rounds increases a person’s chance to get selected and raise above all. So how to prepare for written and group discussion? In this article I will be sharing with you some tricks and practice exercises to prepare really well for written and group discussion rounds. Written rounds have two types of questions broadly. This section includes questions like blood relations, missing data, puzzles and condition based problems. These questions are interesting and can be solved really quick if you have a good presence of mind and good reading skills. These type of questions come mainly in business entrance tests. You have to read a bar graph or pie chart and then a statement sentence will be given followed by a series of questions. If you have good graph reading skills and a little knowledge of percentage and ratio then you will easily solve these questions. Only problem is that they are time consuming and with lack of proper practice you will only be able to solve a few of them. Maths questions come in every written test. These questions include percentage, ratio, tsd(time,speed,distance), number system questions. Well all these topics have been taught to all of us in school and each one of us is familiar with them. But then we fail to solve these only. Some people adopt this strategy of solving a number of papers from some online website without practicing the basics of these topics. This results in learning the answers or just doing them for no reason at all. If you really want to excel in this section then start practicing the basics of mathematics and then move forward to online test series. Series, analogy, mirror images, embedded figures, paper folding and cubes/dices are the types of questions which come under this category of aptitude. There are various books available in the market to practice non-verbal questions. This section comes in IT company’s written tests. These include questions on your engineering subjects. Exams like amcat, toefl have these questions. Well you have lots of time to go through this practice, almost four years of practice if you are a good student of the subject. Just start learning your grammar again and you will score good marks for free if these questions turn up in your written test. There are some tricky sections like reading comprehension, jumble paragraphs or find the synonyms. For these sections you need practice. Verbal reasoning needs to be very strong if you are preparing for GMAT or GRE exams. 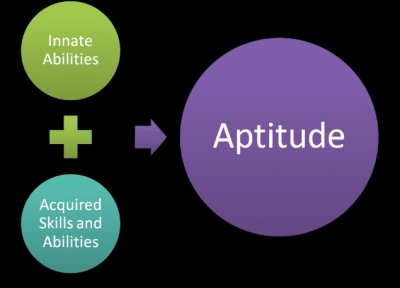 So these are the aptitude questions and for the preparation I suggest you to work really hard on each of these sections, right from this moment. Nothing is as frustrating than not clearing up for ?written exam. ?Make a schedule, buy your books and start practicing your aptitude. Also practicing these questions makes you a smarter person (hahaa joking ;)).